Welcome to episode 23. I’d like to start right off the bat with a question. That is, did you use: Твоя or Ваша? Ideally you should’ve asked: Who are we talking to? Are we speaking casually or formally? In other words, I didn’t really give you enough information to answer. This concept of formal and informal speech is pretty foreign to English speakers, which is why today I’d like to do a lot of practice with it. I don’t have to change my words. I referred to both of them in English as “you.” We don’t even think about it. 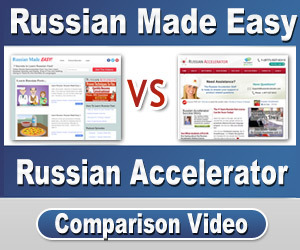 But in Russian….You’d certainly better think about it. 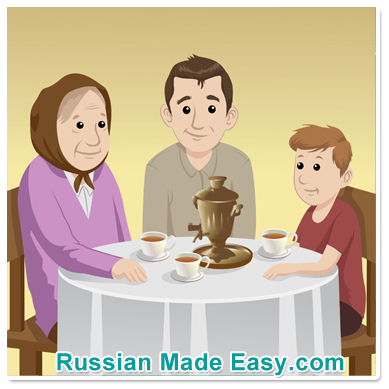 Trust me: Speak to your friend’s grandmother on ТЫ without an invitation to do so, and you’re gonna hear about it later. Tanya, will you have tea? And will you have tea? Literally: To you is pleasing? Something on the TV in the next room causes your friend and grandma to get up from the table and go watch. Being a good host, you pick up their cups of tea and carry them in. And then to her grandmother, say…. Before going on, let’s do a quick review of one of the words we learned last time. This is my pig fat. Ask: Is this my beer? This is your tea, and your milk. Это твой чай и твоё молоко. Say: This is your pizza and your milk. Это твоя пицца и твоё молоко. This is your borscht, your pig fat, and your caviar. Это твой борш, твоё сало и твоя икра. All this leads me to our tip of the day…. We haven’t learned any new words today yet, but that doesn’t mean we’re not learning new things. This is what I was referring to at the end of the last podcast. Another one of the biggest mistakes that new students make is what I call the Gigantor Vocabulary mistake. They try to build a big vocabulary too fast. I wasted my first year of Russian this way, trying to learn every word I could. I mean, I studied the Russian word for octopus, for pond, for engine and so on. But could I use these words? Not really. I didn’t know how to say, “I saw an octopus,” or, “I walked to the pond,” or “I need a new engine,” etc. I mean, what’s the point of learning a new word if you can’t use it? So here’s my tip: It is far better to learn a smaller core vocabulary, and master it, than it is to have a gigantic vocabulary that you can’t really use. Especially in Russian, where each word – as you now know – has many, many forms. And here’s the good news: Once you’ve mastered the core vocabulary of Russian and the grammar patterns that go with them, then it’s easy to pile on new words. Take today’s lesson. Now when you learn a new neuter word, you’ll know what to do with it….at least in certain constructions. You’ll be able to use it. So let’s get back to it. Remember earlier in this podcast we were serving things to our friend and to her grandmother, and that we need to speak formally and respectfully to grandma. So as you serve each of the following items, say simply: Your ____. Hand your friend her milk. Hand grandma her pig fat. Hand your friend her coffee. Hand your friend her pasta. Literally, of course: TO me are pleasing your cars. But what are we literally asking there? She said: How’s your salad? Tasty? See how both the words “your” and “tasty” are in their feminine forms, to rhyme with the word “ikra”? So, as the host, ask grandma the same thing about the pig fat that she’s munching on. Ask her: How’s your pig fat? Tasty? Ask your friend about his pizza. Well, how’s your pizza? Tasty? Ну, как твоя пицца? Вкусная? So what I want you to get used to is switching between formal speech and casual speech. As you go through your day, ask yourself whether – if speaking to them in Russian – you’d address them formally, on ВЫ or informally, using the ТЫ forms. Keep practicing, and I’ll see you in the next episode where we’ll fill out our greetings and chit-chat. See you then! Just wanted to say that I’m loving the podcast! Anything is just perfect about this podcast serial. Thanks Mark! Thanks to you, and your podcasts, I feel really confident about learning Russian. I am an English teacher and I am using almost same techniques for teaching my students. That’s why I am learning Russian very effectively. If you visit Turkey some day, I really want to be your host. Spasibo.